Membership applications cannot currently be submitted on-line. Please click the button below to activate our joining process. bottom of the form and we will be in touch. We now operate one 100m Running Deer Range, two 50m Running Boar Ranges, a 100yd static range and a 10m indoor Running Target Range, all electronically scored. When the Club was formed some of the moving target events were still in the International and Olympic calendar, and we had medallists amongst the members. But like many other shooting events they have gradually disappeared from the Olympic scene although some do still feature in International events. It is an objective of the Club to ensure that these disciplines do not disappear in the UK so that future generations may continue to enjoy them. There is probably little danger of them disappearing altogether because apart from anything else they are fun to shoot and are very popular with the members and with other NRA affiliated clubs who take an affiliation with us so that they can use them. But the targets are technically complex and require a degree of training before they can be used by other clubs. Because our targets are quarry related (deer, boar, fox etc.) we seem to have become the place where sporting rifle shooters, big game hunters, deer stalkers and pest controllers gravitate, and feel at home. Many of our regular competitions relate to skills necessary to hunt successfully and safely as well as being tests of marksmanship. Our regular monthly matches feature events like the Stalkers Test which requires the shooter to fire 2 shots from the prone position; 2 shots sitting;2 shots kneeling; 2 shots standing and the final 2 from a bench simulating the position of a hi­ seat. Apart from the first and last positions the others permit the use of stalking sticks. A stick has always been an essential part of the stalkers kit starting with a simple ash or hazel pole all the way through to new designs with multiple legs and front and rear rifle supports. Whatever is chosen, they need to be quick and easy to deploy and quiet in operation. The twin legged adjustable variety has been the popular choice in recent years . Hunters have to be prepared to take shots from difficult positions. They owe it to their quarry to take the most humane shot possible and that requires a steady shooting position. Prone is undoubtedly the most stable shooting position, but is not possible in tall undergrowth. The sitting, kneeling or standing positions then come into the picture and the sticks provide a front rifle support and stable platform providing the rest of the body is balanced and comfortable. The test provides an opportunity to practice technique in all of these positions. Standing is probably the most difficult, but the sticks do dampen the lateral movement and with practice the fore and aft can also be controlled. Whilst it is not considered humane these days to shoot at moving deer; it used to be the case and Running Deer as a target sport was developed in Europe and Scandinavia where the rules were developed as part of the Nordic shooting disciplines. The discipline does however have a serious practical application as demonstrated by an event called the Swedish Deer Test. The shooter loads two rounds; the operator brings out the deer target so it is visible to the shooter and at rest. The shooter fires a freehand shot; the operator sets the target running and the shooter has to reload and fire the second shot before the target reaches the end of its run. 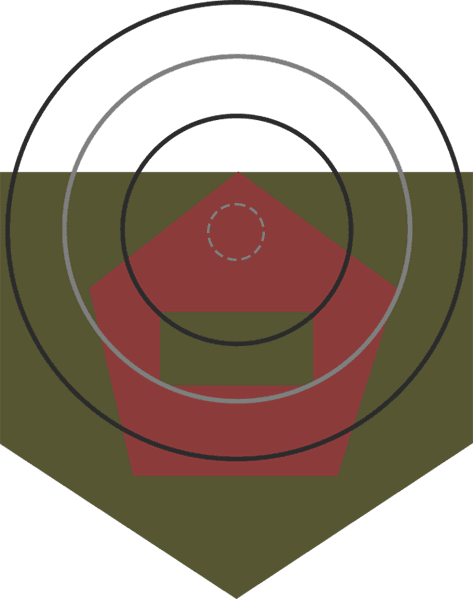 This simulates a position which might arise in the field where for whatever reason the first shot has not brought down the deer which has run off requiring a follow up shot. By comparing the shot positions recorded by the electronic scoring the shooter can see how good his initial freehand shot was and also his second follow up shot should such ever be required in the field. This test still forms part of the qualification required for the grant of a hunting license in parts of Scandinavia. The Running Boar target nowadays has very little relevance to hunting Boar in the wild and has developed simply as a target sport under ISSF rules. It is shot with a.22 Rimfire which would not be suitable for hunting any animal of boar size; nevertheless the techniques required for shooting moving targets are universal and it teaches correct gun mounting, lead and follow-through. Similarly, the 10m Running Target (known rather irreverently as the Running Rat as it is the undoing of many a competitor). This is shot with a .177 air rifle and still an International event where the course of fire is 30 shots slow runs and 30 shots fast runs (an HPS of 600) and the top shots around the world are up in the 590’s. The current British Record, held jointly by two BSRC members, is 569. The scoring area is 80mm in diameter and the 10 ring is 8mm across, so a small error can be very costly. Coupled with a target which is only visible for 5 seconds on the slow runs and half that on fast might explain why it is so challenging! 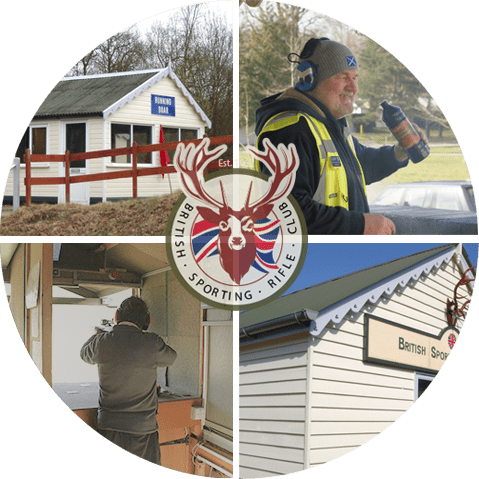 As well as running its own monthly matches, bi-monthly range days and various club discipline matches, BSRC makes the ranges available periodically to the NRA and runs some of the major events for them, like the Running Deer Championship which is an opportunity for NRA members to give it a try. Otherwise access is only available through membership of BSRC or one of the Clubs who are affiliated. It is only by operating in this way that the club can generate funds to run and maintain sophisticated and expensive target systems. But Club activities are not confined to our own ranges. We do take advantage of the proximity of other NRA ranges to put on sporting rifle events at longer distances. One popular event takes place on Century and begins with a DJV fox target at 200yds, falling back to a deer target at 300yds, the deer again at 400yds and so on back to 600yds. This is a severe test of a sporting rifleman and his equipment and an ideal opportunity to learn the adjustments necessary to get out this far and the personal and equipment limitations when shooting at these distances. We also rent the McQueen targets on Century from time to time. In order to practice the latter cheaply with .22 Rimfire we have recently acquired two 50m Mini McQueen targets which are scale replicas of the full-size McQueen Castle with the targets appearing randomly in any of the 10 windows. Scores and results for all of these matches can be found elsewhere on the web-site.